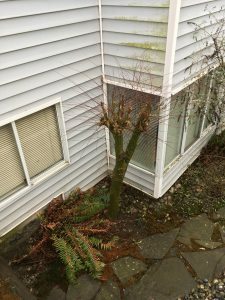 Company News Archives - Proper Landscaping Inc.
Are you afraid of chainsaws? I have an uneasy relationship with machines but I’m not afraid of them. 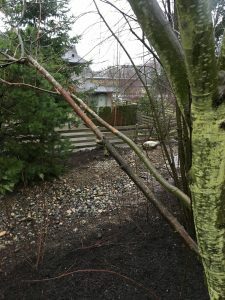 Years ago when I was a candidate in the Landscape Industry Certified program at the Kwantlen Polytechnic University I was literally shaking when I hit the chainsaw practical station. The attendant noticed and asked me if I wanted to walk away. No, never! I did everything correctly but I forgot to put a log in place which made it difficult to cut anything. Oops. Luckily it wasn’t a deduction. I found a log and passed the station. Walk away, don’t make me laugh. 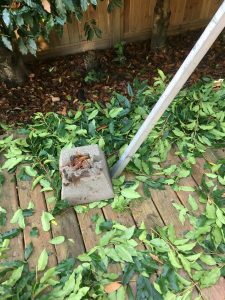 Now, fast forward to 2018 and read about a perfectly good day I had with an old warrior chainsaw. The chainsaw is very old but a new chain made it usable. The bonus was that I got to change the chain myself which was extremely therapeutic. It’s hard for an ISA certified arborist to admit that in my nightmares my chains always break and fly off. So putting a new chain on correctly made me relax. After all, I installed it myself. The other bonus was that I was flying solo and allowed to practice. There was nobody watching. 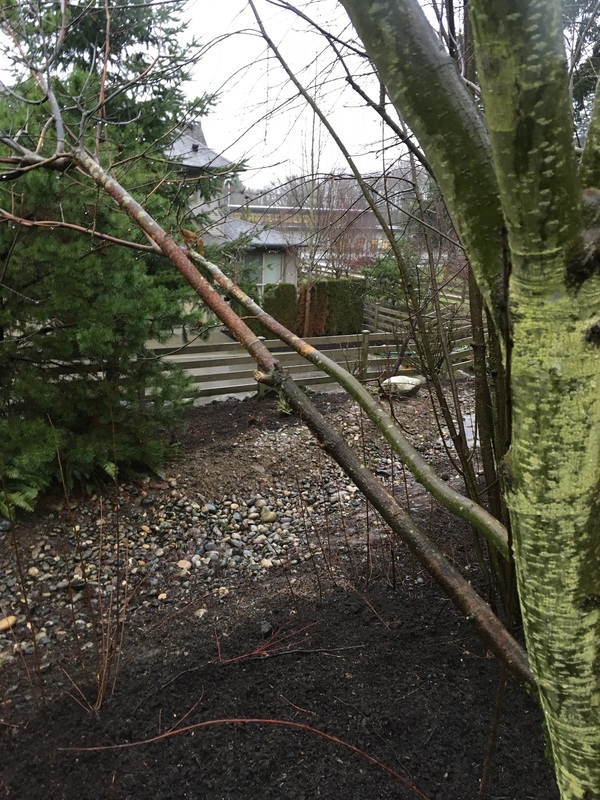 My task was fairly easy: take down six dead birches (Betula papyrifera). There is only so much space available for plants on strata properties. When the complexes are first built they look great but over time, as plants mature, we start to run into problems. 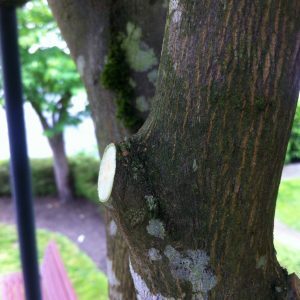 This blog post explores some common examples from my work sites. Some driveways are way too tight. 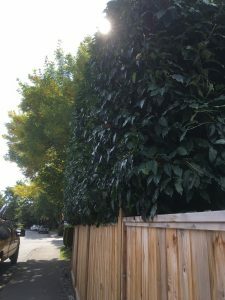 Of course, this isn’t obvious at first because we landscapers don’t live on site. 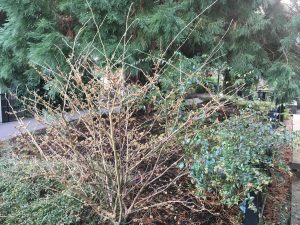 In the picture below there are two Berberis thunbergii specimens planted in front of boxwood (Buxus). Dead space just gets invaded by weeds and landscapers hate dead space. So we plant it up. 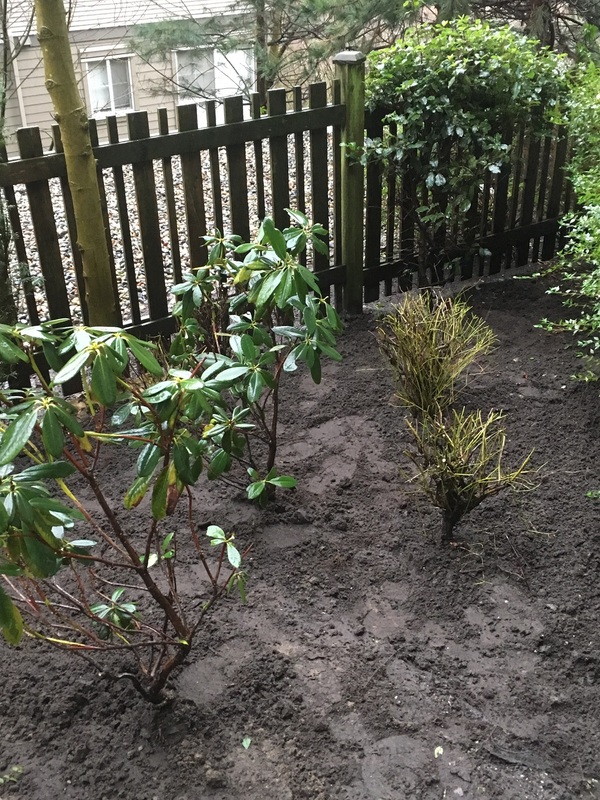 And then the owners come home……There is very little sense in replanting because the owners are bound to reoffend. Berberis thunbergii crushed by a car. 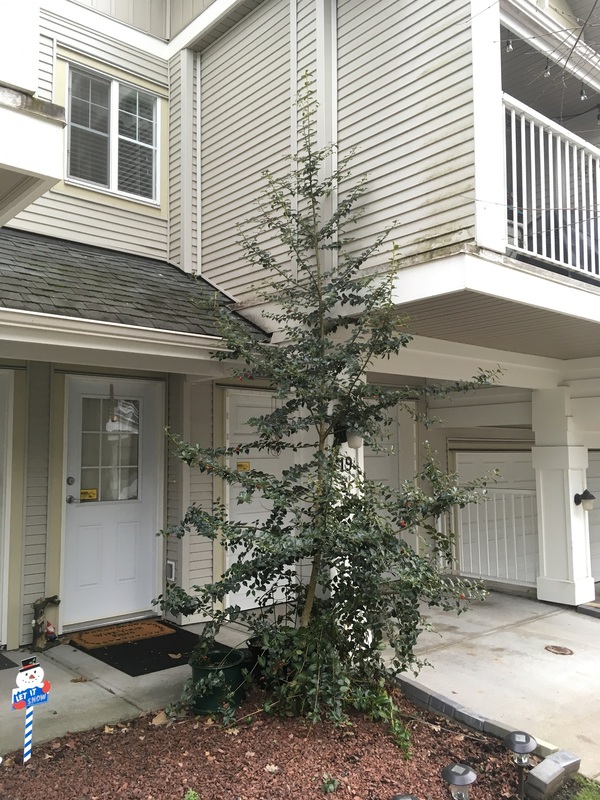 It’s not clear whether this holly was planted by the owners or just simply invaded the space. Whatever the case, it’s way too close to the building. And that gets insurance companies very excited. The holly could be pruned but that wouldn’t solve the problem. 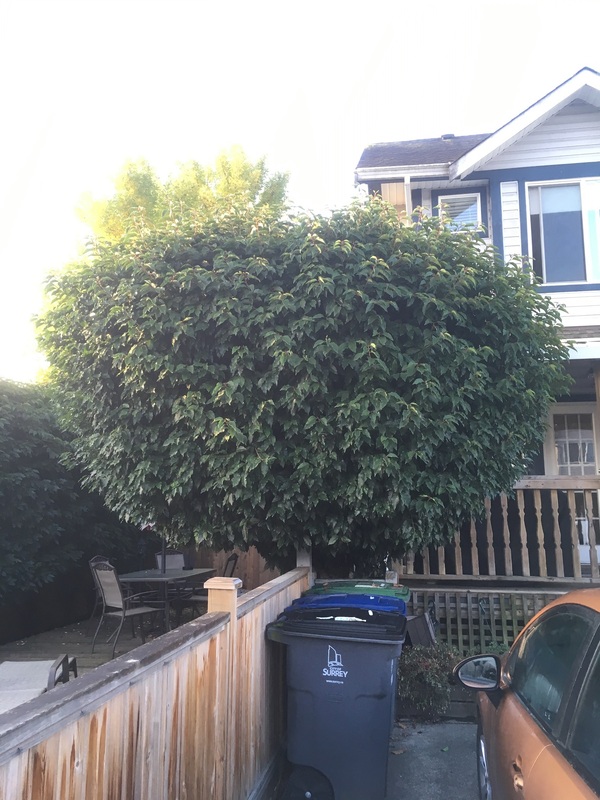 There simply isn’t enough space for this plant. 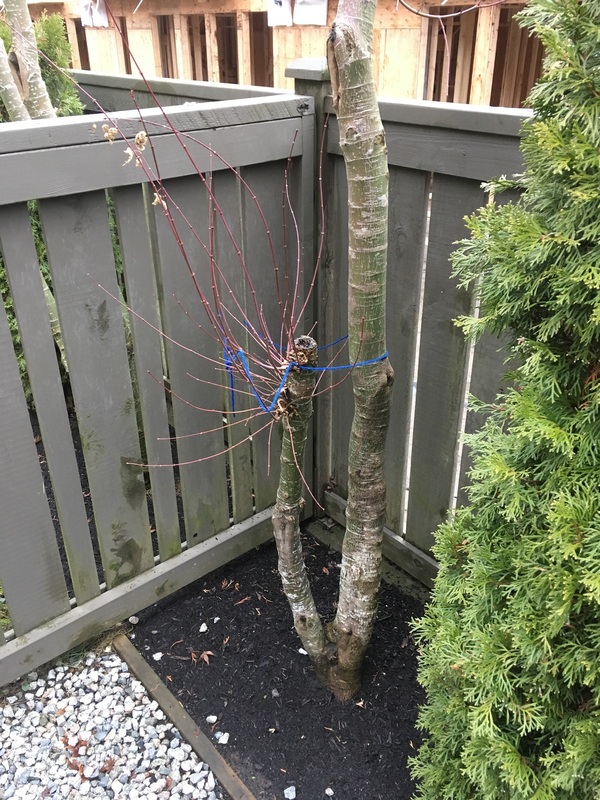 My suggestion was complete removal and replanting with something smaller. 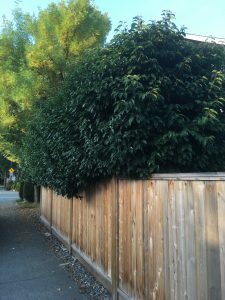 There are many shrubs available that won’t overwhelm this space. I really like this one corner. The Hamamelis mollis shrub is blooming right under a giant sequoia (Sequoiadendron giganteum). The only blemish is the Abelia (Abelia x grandiflora) shrub that’s growing into the witch hazel and through the fencing. 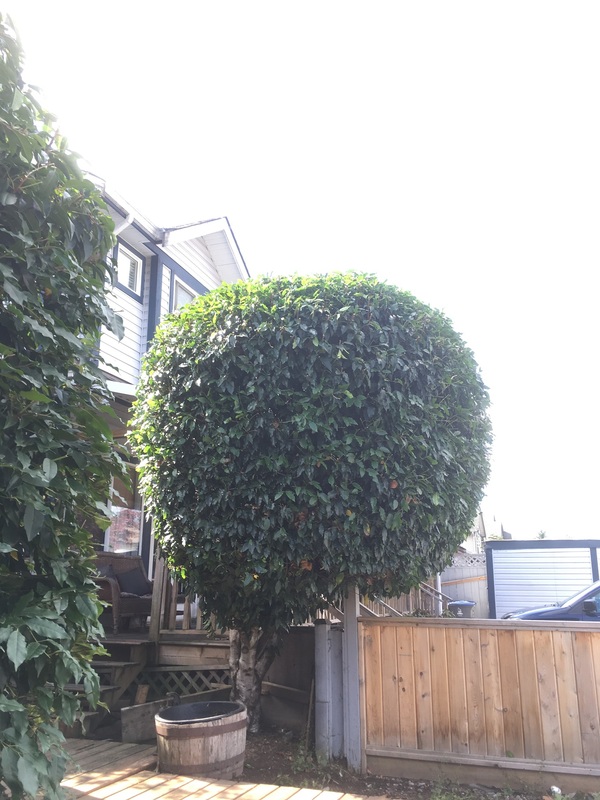 So I gave it a little hand-pruning to achieve a bit of separation. As the landscape matures, there is more and more of this type of work. Sometimes, it’s necessary to edit out plants completely. The idea that trees need room to grow seems obvious but people often forget to look into the future. Do you know the mature size of your landscape trees? Sure they look beautiful when they’re installed but without room to grow they inevitably get abused. 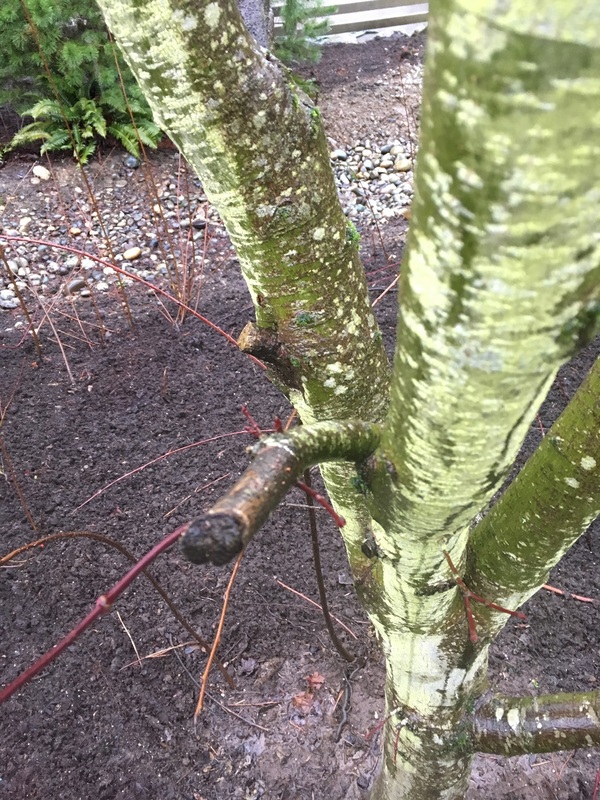 Mainly by harsh pruning. I have selected two examples from many. 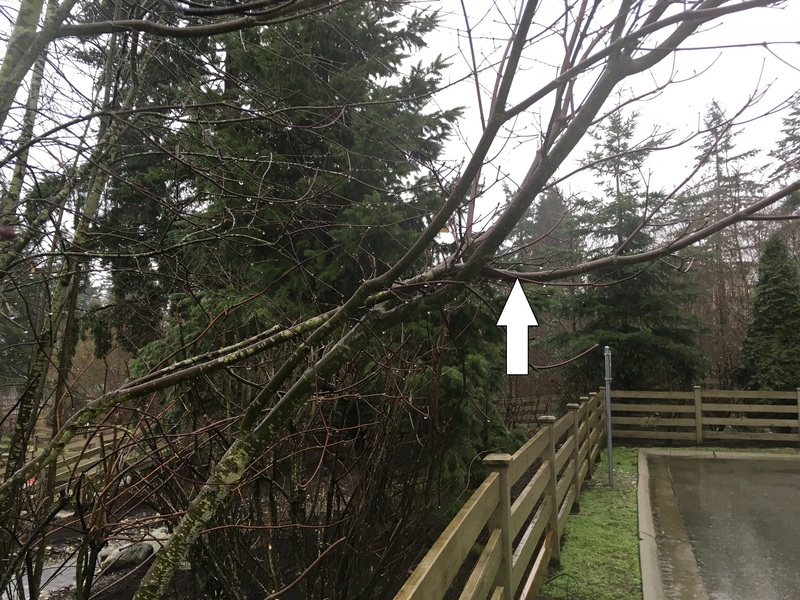 The first maple (Acer palmatum) is the saddest maple I know! The other maple is even worse off. 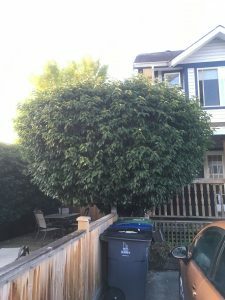 So please remember to consider the mature size of your landscape trees. As an arborist I prefer complete removal to annual hacking. 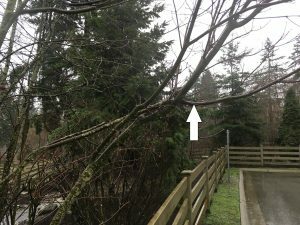 Trees are resilient. They will push out new growth. Except we don’t have the required space for them. The saddest maple I know. 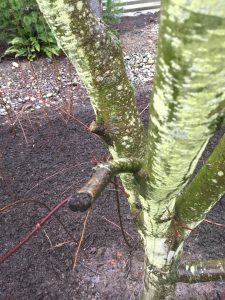 It was planted too close to the unit so it gets hacked up periodically. I would almost prefer complete removal. This is nuts! 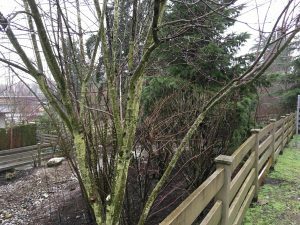 A maple tree requires room for growth. Here it’s too close to a narrow pathway. It also shades out the cedars on the right. Space considerations are a big deal on strata title properties. Remember to give plants room to grow and separate them when you can. Fall is a perfect time for landscape projects like soil and river rock installs. Take today for example. My whole day just flew by and it was nice and sunny. I remember these days when snow starts falling in winter. Let’s take a look at my day. 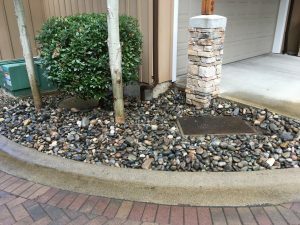 This was actually round two for river rock installs at this particular strata complex. 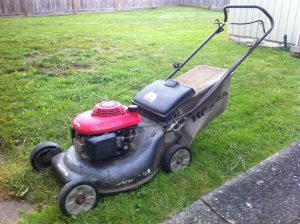 Round one involved removing a weak lawn. It was basically a dog patch and the smell in summer was overwhelming. So I removed it and installed river rock. Round two involved removing Vinca major (periwinkle), which is now considered invasive, and replacing it with 2″-6″ river rock. I like these permanent solutions. I wouldn’t be surprised if next year there will be round three. Once the periwinkle was removed I dug deeper and cut a few selected roots off the two poplars. Since the soil was fine I disposed of it on site in the back wild zone. Since efficiency is important, I moved my truck as close as I could to the bed and went at it. 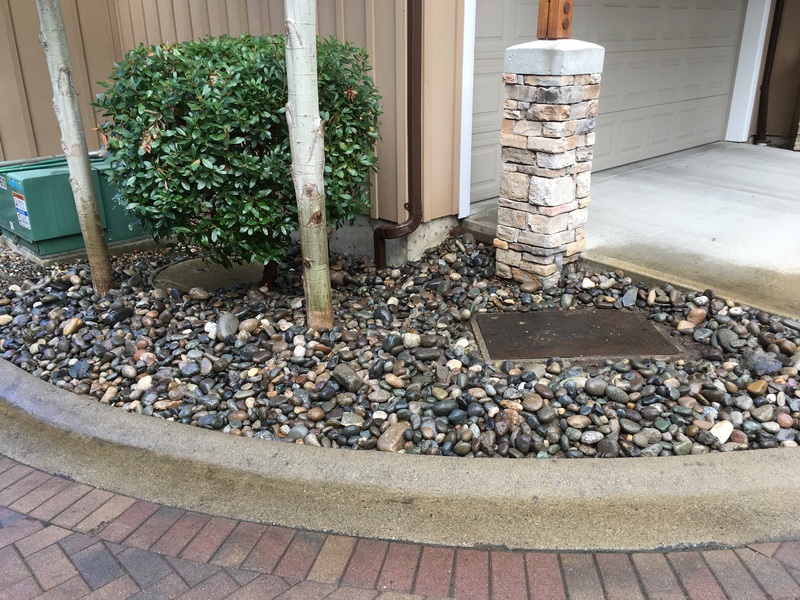 The entire load was 1.5 yards of 2″-6″ river rock; tax included $78. There is one important step you have to take before you pack it in. Find a hose and wash off the river rock. Leaving it all sandy would detract from your finished look. I had to find hoses and outlets which was annoying but well worth the effort. Also hose off the curb. Remove some soil so the river rock is nicely anchored. Take the time to hose off the sandy river rock. Next I moved to the front entrance. 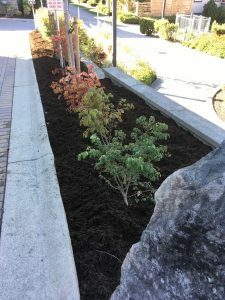 The main strip bed has newly planted trees and shrubs but the soil didn’t look great. 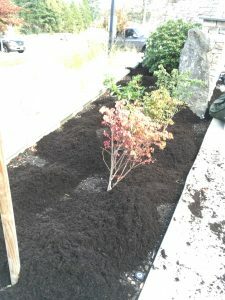 So I installed two yards of aged mulch at $80 tax included. It gives this high-profile bed an instant new look. It will settle eventually but I love the fluffy look. It’s money well spent. Aged mulch purchased literally two blocks away. All done. Note clean edges. I wasn’t done yet. 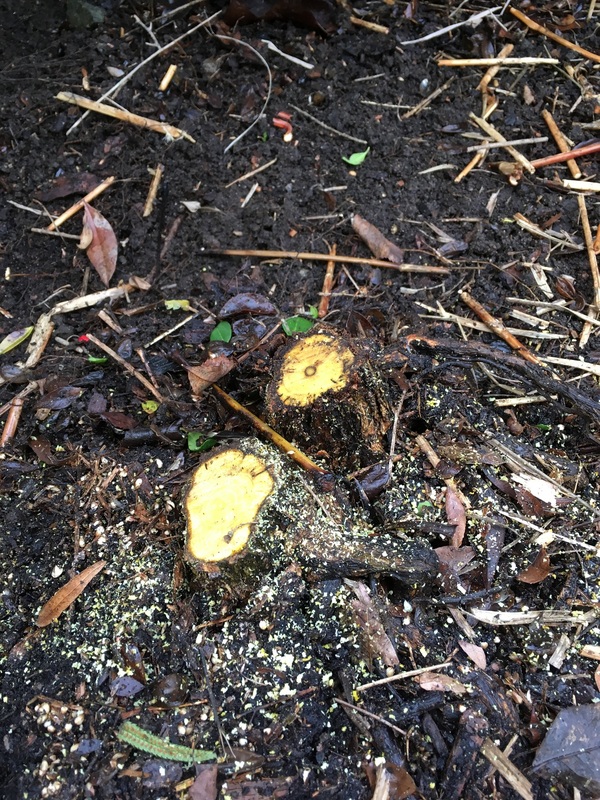 My end of the day ‘cool down’ involved one unwanted Thuja plicata tree. I hate removing perfectly healthy trees but I had to complete all work listed in the strata quote. That way the boss can send out his invoice. Some days click perfectly and the hours fly by. This was one of those days. And I hope there are many more. Fall is a great time for landscape projects like soil and river rock installs. What can you change about your property? 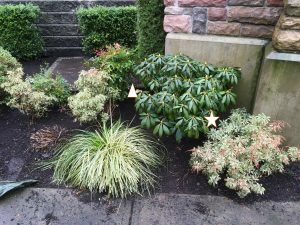 Can you fake a new turf install? I don’t recommend it but it’s possible to fake your new turf installation. I got to see it last week but it definitely wasn’t my first time. It happens from time to time with home owners. If professional landscapers worked like this they wouldn’t be professionals. Let me start by saying that I give people full marks for taking action and trying things out even though they aren’t professionals; and don’t want to pay for professional help or fight with their strata council. This example comes from Langley. The mother-daughter pair looked very happy with their project. They evidently googled it. The idea is very simple. When you get tired of looking at your weak, beat up and dog urine soaked lawn you simply purchase new turf chunks and plop them on top of the existing grass. There. Done. 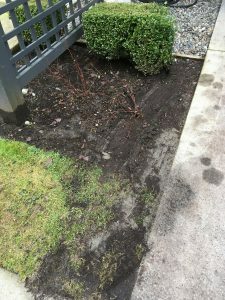 Normally you would use a turf cutter to remove the existing turf and rototiller to work the soil. Obviously, this would make the project much harder for busy home owners working outside in the middle of a heat wave. I repeat, I give them full marks for trying and for their enthusiasm but we’ll see how well the new sod does. I think they’re pushing their luck and here’s why? 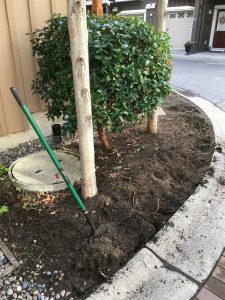 a) The soil should be nicely prepared ahead of time. All existing turf should be removed and the soil nicely turned over with a rototiller. 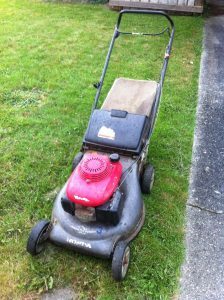 Then, we rake it over and roll it flat with a roller. 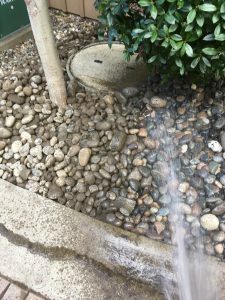 Since we’re in the middle of a record-breaking heat wave, the soil should be well watered-in days before any sod installation happens. 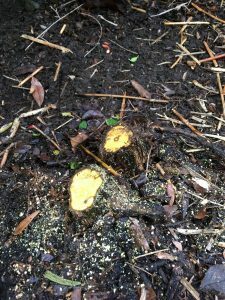 Sod roots poorly on poor soil. It requires porous, moist and cool conditions. This project didn’t any of the three criteria. 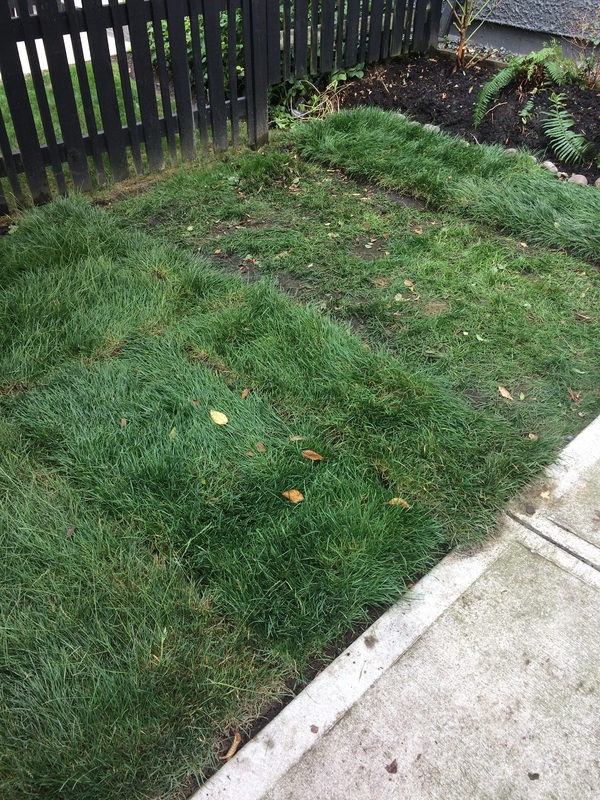 How does the sod root into existing turf below? It can’t be easy. I wouldn’t call it porous. Remember, most of the sod roots have been shaved off so now it will be a struggle to absorb water efficiently. b) The mother and, I must point out, very cute daughter underestimated the amount of sod they would require. But unlike time-stressed landscape contractors they cheerily drove off to get more. You can go online and use sod calculators. All you need to know is the length and width of your yard. Hint: always order a few extra pieces to allow for mistakes and mishaps, theft, etc. c) I feel like the ladies rushed the install, thereby leaving huge gaps. 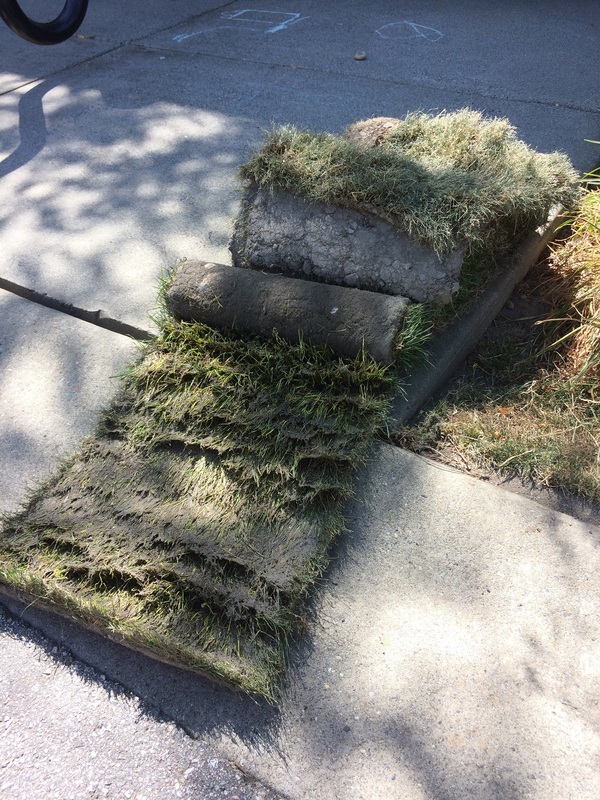 Ideally, the sod pieces should fit together nicely. 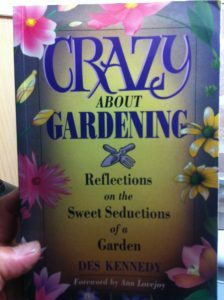 In this yard you are inviting weeds to sprout in the gaps. They should also consider the application of turf starter fertilizer. On the way home we reminded them about watering the new sod religiously and wished them well. Since we maintain this site weekly, I’m hoping to have follow up pictures. It makes for an interesting case study. 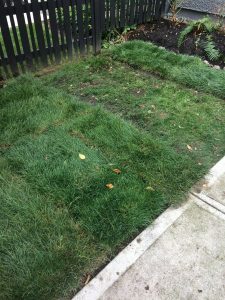 Can you fake a new turf install? Always install new sod same day and never leave it over 24 hours.